FM Approvals has been made aware of a counterfeit Certificate of Compliance (CoC) issued by FM Approvals. FM Approvals has no relationship with the company identified on the certificate illustrated below and the products illustrated on the certificate are not FM Approved. Nanjing Fire Protection Tech Ltd. This is the legitimate business address for Nanjing Fire Protection Technology Co., Ltd. According to FM Approval sources in China, Nanjing Fire Protection Tech Ltd. (no known web address) has been circulating false certificates to buyers in the Middle East and South America. The falsified certificates contain the business address of a legitimate company doing business in China as Nanjing Fire Protection Technology Co., Ltd. (www.tuna.com.cn). 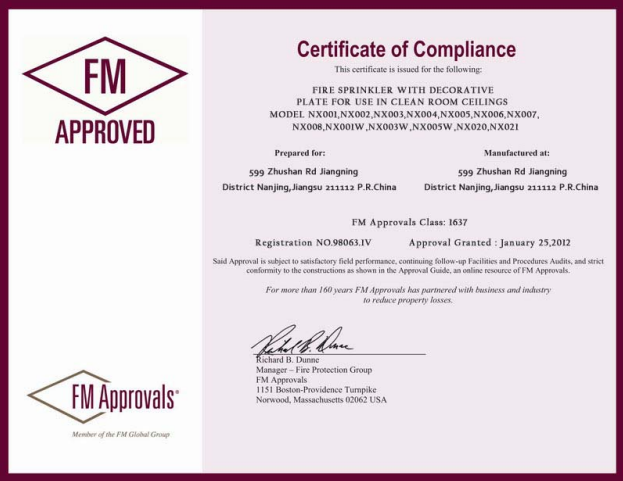 The falsified certificate identifies several models of fire sprinklers for Nanjing Fire Protection Tech Ltd. The certificate illustrated below is a falsification of an FM Approvals certificate. FM Approvals has no relationship with the identified company. Any company falsely claiming FM Approval of any products will cause confusion in the marketplace and can mislead users into a false sense of a relationship between FM Approvals and the manufacturer. These products have never been tested and certified by FM Approvals. Only products listed in the FM Approval Guide www.approvalguide.com can be considered authentic FM Approved products. Please Note: The address used on the falsified certificate above is the legitimate business address for Nanjing Fire Protection Technology Co., Ltd.